Objectives Crew resource management (CRM) training formats have become a popular method to increase patient safety by consideration of the role that human factors play in healthcare delivery. The purposes of this review were to identify what is subsumed under the label of CRM in a healthcare context and to determine how such training is delivered and evaluated. Design Systematic review of published literature. Data sources PubMed, PsycINFO and ERIC were searched through 8 October 2018. Eligibility criteria for selecting studies Individually constructed interventions for healthcare staff that were labelled as CRM training, or described as based on CRM principles or on aviation-derived human factors training. Only studies reporting both an intervention and results were included. Data extraction and synthesis The studies were examined and coded for relevant passages. Characteristics regarding intervention design, training conditions and evaluation methods were analysed and summarised both qualitatively and quantitatively. Results Sixty-one interventions were included. 48% did not explain any keyword of their CRM intervention to a reproducible detail. Operating room teams and surgery, emergency medicine, intensive care unit staff and anaesthesiology came in contact most with a majority of the CRM interventions delivered in a 1-day or half-day format. Trainer qualification is reported seldomly. Evaluation methods and levels display strong variation. Conclusions Critical topics were identified for the CRM training community and include the following: the need to agree on common terms and definitions for CRM in healthcare, standards of good practice for reporting CRM interventions and their effects, as well as the need for more research to establish non-educational criteria for success in the implementation of CRM in healthcare organisations. The systematic review is based on a comprehensive search and includes a large number of studies from a broad spectrum of healthcare settings. A publication bias can be assumed in the crew resource management (CRM) literature because most authors are evaluating a training programme developed and delivered by themselves. However, in this review, this bias is acceptable in that effect size evaluation is not within the scope of the manuscript. Only publications were included that reported both the intervention and related effects. This excludes theoretical considerations of CRM training as well as studies reporting effects that were not specific about the intervention or applied a standardised format that might be described elsewhere. A meta-analysis could not be performed due to variability in reporting quality and data availability. First efforts to transfer CRM training from aviation to healthcare teams were initiated in the 1980s as ‘anaesthesia crisis resource management’.7 In recent years, there has been a steady increase in the number of healthcare team- and CRM training publications. Figure 1 demonstrates this increase in publications as a timeline based on a PubMed literature search. Proportion of crew resource management (CRM) training publications listed in PubMed. Proportion is calculated as CRM publications per million total records in PubMed for a 3-year span. See the Literature search section for full search string; graph shows all search results before screening. Today, there are few standardised curricula that address the impact of human factors on medical teams. One example is the systematic approach provided by the Team Strategies and Tools to Enhance Performance and Patient Safety (TeamSTEPPS) programme.11 It is a direct outcome of the Institute of Medicine ‘To Err Is Human’ report1 and defines a set of knowledge, skills and attitudes for teams, each with a definition, behavioural examples and supporting evidence as literature citations. In contrast, many other human factor team trainings are self-constructed interventions for individual hospitals or hospital units described as ‘CRM training’. Those are the focus of this review. The purpose of this review is to complement those approaches by focusing on team trainings in healthcare that explicitly claim to be delivered as a CRM format, or synonymous aviation-derived human factors training. We aim to investigate the content of trainings that are individually constructed but subsumed and labelled as ‘CRM’ interventions in healthcare. Further, this review seeks to identify what is ‘inside the box’ of CRM training in a healthcare context, to understand the conditions in which the trainings are delivered and to determine how such trainings are evaluated. Publications were reviewed that reported CRM-like interventions or trainings (both terms used synonymously here) in healthcare environments. Given the history and ongoing evolution of the concept, studies using ‘Crew’ and ‘Crisis’ Resource Management were both included. Specific attention was paid to the eight properties described in box 1. Description of intervention: What was the setting and/or format; which CRM content or theories were taught? Duration of CRM training: How many contact-hours did the training intervention include? Target group for training: What kind of attendees did the training address? Number of participants: How many individuals attended each course? Trainer qualifications: Which qualifications were reported for the CRM trainers? Level of evaluation: At what level, according to Kirkpatrick,17 can the reported effect be categorised? Method of evaluation: By what design and means was the evaluation carried out? Reported outcome: What is the summary of the study’s findings? Studies that reported individually constructed ‘CRM training’ or trainings based on CRM principles were evaluated within a healthcare context and included hospitals, their departments, emergency medical services or medical education. Only studies that both described an intervention and also reported its effects were considered. Types of participants: healthcare staff. Types of intervention: individually constructed training formats addressing CRM principles or aviation-derived human factors. Types of outcome measures: studies reporting both the intervention and its effect. Report characteristics: published in an academic journal, either in English or German. Studies were identified by searching electronic databases as well as an additional snowball search, for example, scanning reference lists of relevant articles. Since CRM is a topic that impinges on several disciplines, the search strategy covered databases from different fields. PubMed was used for healthcare publications. PsycINFO was used for psychological publications. ERIC was searched for educational publications. General search terms were ‘crew resource’ or synonymously ‘crisis resource’ and ‘training’. The last search was completed on 8 October 2018. PubMed: ((((crew resource[Title/Abstract]) OR crisis resource[Title/Abstract]) OR human factor[Title/Abstract]) OR human factors[Title/Abstract]) AND training[Title/Abstract]. PsycINFO and ERIC: AB ("crew resource" OR "crisis resource") OR TI ("crew resource" OR "crisis resource") AND (AB training OR TI training). All articles identified for this review were entered into MAXQDA, a software tool for qualitative and mixed-methods data analysis (MAXQDA, V.12; VERBI Software, Berlin, Germany). Semistructured explorative coding and coding framework development: At initial analysis, publications were coded for the following topics: (a) descriptive data about the intervention, (b) design of the intervention, (c) training conditions and (d) evaluation. This approach provided an understanding of the aspects of CRM trainings found within the literature and also provided a framework for more detailed coding (eg, the initial expectation was to find didactical concepts, educational objectives or specific reasons for the implementation of CRM trainings, but instead we found that few articles mentioned these details). Focused coding: In the next stage, all articles were read again with the detailed coding structure derived from stage 1 wherein words, sentences or whole paragraphs related to a topic were coded in detail. Compilation of results: Finally, a data table was assembled from the coded data, summarising each article in the review, with key data included according to the eight general properties of interest to this review. The articles were read and co-coded by two reviewers (BG, LR). Disagreements were resolved immediately; when necessary, a third researcher (AZ) was consulted. Data items were coded and assembled in quantitative dimensions. Some data items required further processing. Keywords used in the intervention description and their respective level of detail were categorised as well as the description of trainer qualifications and the level of evaluation. The keywords that related to training content (eg, ‘communication’, ‘situational awareness’) were assessed across all included publications. Each publication was then categorised for keywords and whether an explanation or definition was provided, which would allow for replication of the procedure. Level 1 ‘reactions’: for example, questionnaires administered to participants directly after the training or in close temporal proximity, inquiring after their happiness, satisfaction, knowledge or perceived own performance. Such reaction data were gathered as direct feedback from the participants. Level 2 ‘learning’: neutral proof that participants learnt something during the intervention. This could be observed and documented by facilitators or through an examination that participants completed after the training. Level 4 ‘results’: effects of the intervention on visible outcomes within the whole organisation, which were supported by data. This was assumed to be the highest level of evaluation in that such data would relate invested effort in training to impact on the organisation, for example, a reduced rate of mistakes or adverse outcomes. Patients and/or public were not involved during any stage of this study. The search of PubMed, PsycINFO and ERIC databases provided a result of 1037 publications. Through an additional manual search, 13 further publications could be identified that were included in the reviewing process. Each article’s eligibility was assessed by two reviewers (BG, LR) in an unblinded standardised manner. First, the list of search results was screened for duplicates and obvious inclusion or exclusion criteria. Studies were excluded that described an intervention without report of evaluation data, reported evaluation data but without description of the intervention, did not describe a CRM-style intervention or did not take place in a healthcare context. Also, studies were excluded when reporting the application of a standardised training, like TeamSTEPPS, if not applied as an individualised version. A total of 877 publications were excluded for these reasons. Disagreements between the reviewers were resolved by discussion. Nineteen publications were discarded because the full text of the study was not available. This resulted in 154 publications that contained full text. After further detailed examination, another 90 publications did not meet the inclusion criteria, for example, training that focused on a single communication aspect and did not encompass a more comprehensive teamwork approach for several aspects of human factors management. The process of study selection is depicted in figure 2. For the 154 studies that entered the in-depth reading stage, 3265 passages (eg, training description) or data items (eg, number of participants) were coded with 91 different codes. Six hundred and seventy-three memos or summary texts were inserted by the reviewers. Three pairs of publications were based on the same data (reporting different aspects of that data) and were treated as a single publication. In consequence, 64 publications were included in this review, but technically, 61 interventions were assessed. See table 1 for a full list of publications included in this review. See online supplemental file Digital Content 1 (SDC 1) for a comprehensive compilation of study characteristics. Table 2 and figure 3 indicate the keyword count mentioned in the publications and whether a description of the CRM intervention content or foundational theory was provided. Approximately 23% of the mentioned keywords were explained with sufficient detail for reproducibility while 48% of the publications did not explain any keyword with sufficient detail for reproducibility. The criterion employed was whether an expert proficient in CRM research and practice could comprehend and reproduce the intervention based on the information given and the references provided. Crew resource management (CRM) content in training descriptions: keywords versus provided reproducible explanation. SBAR, situation, background, assessment, recommendation. The professional groups with the most CRM intervention training were operating room or surgery (21%), emergency medicine (20%), obstetrics and paediatrics (16%), intensive care units (ICUs) and anaesthesiology (13%). Students and learners were the target group for another 13% of the trainings. CRM training group size ranged mostly from 5 to 15 participants (see figure 4A). The smallest group size was composed of seven faculty surgeons who were individually trained via a 1-hour lecture.20 The largest reported group size was classroom-based CRM workshops at several sites with a maximum of 35 participants.21 Forty-four per cent of the publications did not report the number of participants per course. (A) Participant group size for crew resource management interventions (n=34). (B) Boxplot of intervention programme sizes (n=53); three group sizes with relatively high numbers are not included in the boxplot calculation but denoted with an asterisk. The solid line indicates the median. Whiskers indicate the maximum or minimum scores that are not outliers. Of all studies, 53 (87%) reported the total number of CRM intervention participants. Together, these studies represent CRM programmes with about 19 500 participants. The large number of participants originates from only two studies accounting for 53% of the sum of training participants.25 26 Both publications refer to different aspects and timeframes of the same large-scale CRM implementation so that an overlap in participants must be assumed as bias in this calculation. Another outstandingly large intervention with 1300 trained participants stems from a multiple-hospital intervention.27 Figure 4B displays intervention programme sizes as boxplot. Not available (n/a) or not specified (n=13), for example, ‘trained facilitator’ or ‘a medical education expert’ (n=8). Description of a (medical) professional or someone with technical qualifications, for example, ‘four instructors (two emergency physicians and two anaesthesiologists)’ (n=11). Non-medical qualifications that indicate didactic or psychological competence or explicitly state external consultation with professionals, for example, psychologists, aviation trainers, consulting company (n=19). Specific education or preparation of trainers is explained (at least in duration and content) (n=10). Overall, 34% (n=21) of the studies did not report or specify staff qualifications for the training intervention. Eighteen per cent reported qualifications that were medical or technical but did not indicate expertise in CRM theory or practice or in any didactic competence. Thirty-one per cent (n=19) mentioned psychological or didactical qualifications of the trainer team or stated that external expertise assisted with the training. Only 16% (n=10) of the studies specifically explained how staff were prepared and trained as CRM trainers. The majority of studies, 34 of 61 (56%), reported data for Kirkpatrick level 1, with 13 publications (21%) built solely on level 1 data. Fifteen studies (25%) contained level 2 data, 31 (51%) level 3 data, and 20 (33%) reported effects for level 4. Figure 5 summarises the evaluation levels for these studies. The vertical axis distinguishes between evaluation levels with the studies indicated on the horizontal axis. A light grey marker indicates deviations from Kirkpatrick’s concept, for example, when safety attitudes questionnaires were administered immediately following a training intervention instead of allowing participants a delay of several weeks for attitudinal changes in daily practice. The grey marker also indicates reports of qualitative but no quantitative data. Studies and their level of evaluation (1–4). The figure demonstrates the combination of levels chosen for evaluation of the crew resource management intervention effect, starting with only level 1 on the right and progressing to multiple levels, including level 4, on the left. Studies marked with a light grey colour reported qualitative data for a level or differed methodologically to the Kirkpatrick concept. 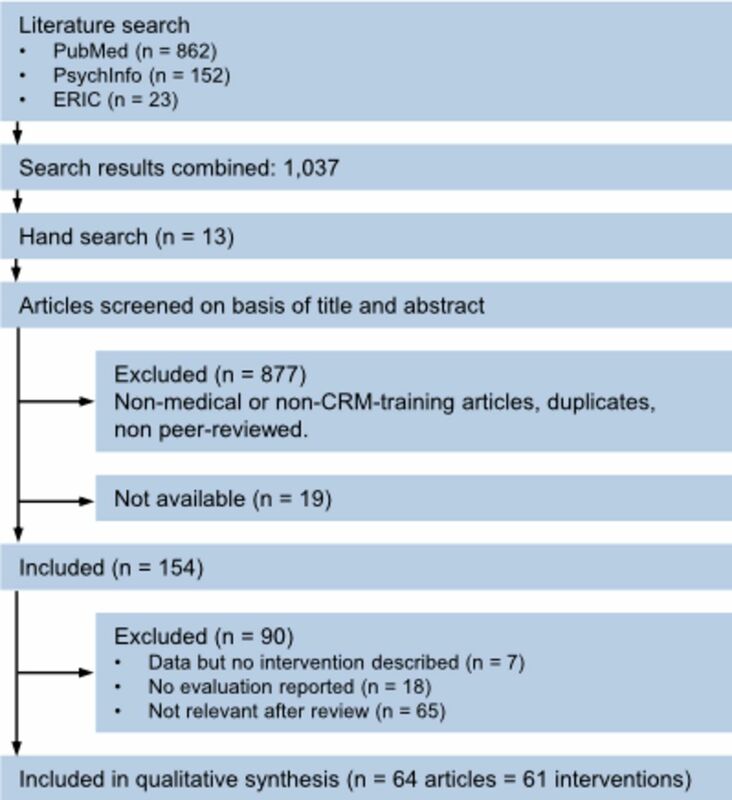 The purpose of this systematic review was to analyse the published content and practice of CRM interventions within a healthcare context. We wanted to know what composition of theories and skills were considered under this training type and how their impact was evaluated. A set of 61 studies (64 publications) met inclusion criteria and were analysed and summarised both qualitatively and quantitatively. There is no easy answer to the question ‘what is CRM in healthcare’? Diverse concepts and methods of communication and collaboration were found from which CRM trainings were composed. Training formats and evaluation approaches varied such that CRM appears currently to be less a tangible training intervention but rather an umbrella under which healthcare organisations can manage human factors and safety training. An unexpectedly large number of publications in this review did not provide a description of the intervention, which would have permitted future study replication. 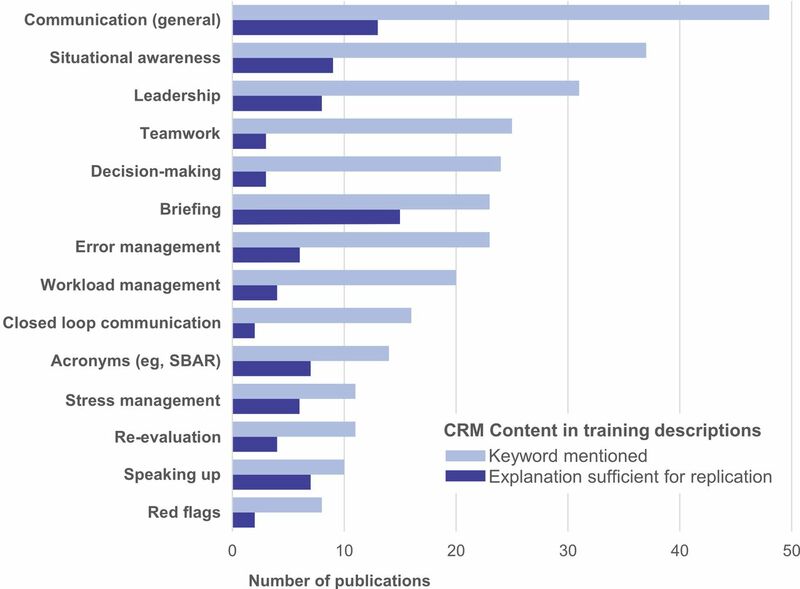 The increasing number of publications indicates a rising interest in CRM training interventions by many practitioners and scientists within medical contexts. CRM training for aviation evolved over several conceptual generations.5 Presuming a similar process for the healthcare domain, this investigation provides a snapshot of the state of CRM training in healthcare. It also provides transparency and inspiration for those who want to design and implement future CRM formats. Also, it may be useful to fellow researchers who intend to evaluate an intervention’s effects. A particular focus of this review was to examine what healthcare CRM training consists of and to identify the conceptual core from which such training was derived. The results provide only a fuzzy image of how CRM is practised in healthcare contexts. Figure 6 identifies the most frequently used keywords in CRM descriptions. It is provided as a Word Cloud where font size is determined by the occurrence of a term (compiled from table 2). The pattern seems representative for the scope of CRM trainings inherent in the literature: CRM was found to be attributed to communication in general as well as to specific communication techniques (such as briefings or closed loop communications) in particular; it also draws from psychological concepts such as situational awareness or decision-making, and it relates to management aspects like leadership, teamwork and workload management. However, the reviewed studies lacked a shared definition of CRM—like a framework for all those terms. They also indicate the need for a structural model that distinguishes between theoretical, conceptual and technical levels of CRM. Word Cloud for topics considered by crew resource management (CRM) interventions. Forty-eight per cent of the studies did not provide adequate detail or keywords that would allow the CRM intervention to be replicated. It was common for a term or concept to be used as part of a CRM intervention but without a definition of the term or concept. In 48 articles, ‘communication’ was a content keyword, but only 13 further specified this topic (eg, a description of what it exactly means to train participants in communication). Similarly, 24 articles identified ‘decision-making’, but only three delivered a reproducible explanation of how this was implemented in the training. Few articles included an extensive description of their curriculum. In contrast, Morey et al 36 provided a good practice example for a structured description of course components while others referred to a Wiki-website as reference for CRM. Although rationale may exist in specific cases, inaccuracy has the potential to weaken the validity of CRM research and limits possible insight to be derived from future meta-analysis of this field. Those studies indicated that the CRM intervention was not only delivered as training or coaching but was also embedded in an organisational change process or was at least accompanied by organisational change-management measures. Unfortunately, of the publications identified in this subgroup, only few reported means, SD and sample size, which are data necessary for effect size calculation. Hence, we were unable to perform a meta-analysis. Our observations can only provide a direction for future research. The additional non-educational factors beneficial to CRM training are largely unknown. However, the essential meaning of organisational support for the success of CRM and positive sustained effects of CRM trainings has been emphasised.8 If training alone will not provide a noticeable change in behaviour, more research is needed to understand the prerequisites and necessary measures at the organisational level for successful implementation of CRM in hospitals. CRM training interventions are constrained by time in healthcare settings. The majority were delivered in a day or less, nine interventions took 12 to 16 hours, and only six of the programmes exceeded 16 hours. Such short training periods can hardly provide adequate time to cover the many topics encompassed by CRM keywords found in the studies. It is more realistic for CRM-type interventions to focus on particular themes of CRM and place emphasis on a subset of topics during the training intervention. However, this limits the comparison of CRM interventions as well as the analysis of their effectiveness. In this review, more than 80% of CRM training was delivered to professionals who work as teams in operating rooms, emergency medicine, ICUs, anaesthesia or obstetrics. These teams will often fulfil characteristics outlined by Hughes et al. : low temporal stability, short team life span, functional role structure, high skill differentiation, rotating leadership structure, high authority differentiation and high interdependence.13 These healthcare teams are confronted with critical situations on a regular basis and therefore likely acknowledge the benefits of CRM. This may explain the dominant representation of these kinds of teams among the study populations. However, it is reasonable to assume that CRM would benefit other teams involved in patient care as well. The number of training participants per group typically ranged from 5 to 15, indicating a high degree of dense and interactive training. Further, there was no reason to assume that CRM training necessarily involved high-fidelity simulators or that CRM and simulation training were inseparably related. In fact, 43% of the training outlined in the assessed studies was classroom-based. This proportion may be lower due to the varying availability of comprehensive curriculum descriptions. It still seems plausible as Cook et al compared the effectiveness of technology-enhanced simulations versus other instructional methods.42 They found only small to moderate positive effects, but concluded that the merits of simulation likely vary for different educational objectives. CRM training seems to reflect this variability in that the use of simulators is the choice of the educator—but not a necessity. Since the contents and theories contributing to the field of human factors are derived from various scientific areas, it would be expected that the selection of trainers would reflect various professional backgrounds. It would also be reasonable to assume that trainer preparation prior to the CRM intervention would be a key consideration. However, only a small number of articles explained trainer education. Approximately one-third of the articles mentioned trainer backgrounds in psychology, educational science, or that external expertise was employed to provide the intervention. Regarding the latter, reporting should improve: being employed from an external supplier does not necessarily qualify a trainer nor does it indicate that such a trainer is a human factors professional. In contrast, many articles were very precise in describing the technical setting of the intervention, including the manufacturer and type of simulation equipment used. However, more than half of the studies did not report the qualifications of the faculty nor their professional background or preparation for the challenges of interactive training formats with a small number of participants. Standardised tools in the form of attitude questionnaires were used to assess level 3 outcomes. Some studies calculated adverse outcome indices to describe level 4 effects.27 34 35 39 46 47 For future research, these indices will allow for comparison of CRM effects and organisational outcomes. However, the challenge will be to separate the impact of the CRM intervention from other factors influenced by the organisation. Although some studies evaluated large-scale CRM programmes involving different hospitals,21 25 27 34 35 48–50 most refer to a very specific training format at a single site. Few studies reported the number of participants of their intervention in comparison with the number of staff employed in a unit or hospital. The investigation of the ‘critical mass’ needed to be trained for an organisation-wide impact on safety culture might be worth further research. Most reported intervention programme sizes ranged from some dozens to a few hundred participants. This indicates that data stems from evaluations of new initiatives rather than long-running and broadly implemented programmes. In the future, it will be important to investigate the long-term effects of CRM programmes at the organisational level as well as reporting long-term outcomes and adjustments due to such programmes. CRM is often advocated as essential to patient safety. Hence, investigations need to be more precise in describing CRM intervention ingredients, who should receive it, who actually receives it, in what dosage, at what time, in combination with what and to what effect. To reach an evidence-based level for CRM interventions in medicine, it is of utmost importance to develop common concepts, wording and publication standards. The word limit of some academic journals will not allow a comprehensive and reproducible description of a CRM intervention to be published together with a sound evaluation. Common standards and more extensive use of study protocols or digital supplements may be an option in such cases. Based on the data herein, CRM is an important tool that improves teamwork and patient safety. Nearly all studies in this review reported positive effects. However, there is reason to assume a significant publication bias for authors evaluating a training programme mostly developed and delivered by themselves. This bias is acceptable in that the focus of this review was not to evaluate outcomes but rather to analyse the concepts of CRM training in the broadest sense. Only studies were included that reported both the intervention and related effects. This excludes theoretical considerations of CRM training as well as studies reporting effects that are not specific about the intervention. A formal quality assessment of the studies that met the inclusion criteria was not applied despite the requirement to be published in an academic journal. The quality of the articles in this review varies and is a potential source of bias. This is mitigated by the focus of this review on compiling an overview of approaches for design, delivery and evaluation of CRM interventions. The efficiency of those CRM trainings was not assessed. However, from the set of studies included in this review, only a portion would qualify for a meta-analysis. This review provides an overview of topics covered in CRM interventions, the design and duration of training, and the evaluation methods. It also demonstrates that CRM training is much more than merely simulation training. Actually, the term ‘CRM’ appears to be loaded with such a plurality of skill areas, topics, multiple settings for training, and evaluation procedures, that a process by which to define common core values and standards is necessary. Practitioners and researchers need to agree on common terms and definitions regarding the meaning of healthcare CRM. Researchers should consider good practice for reporting intervention design and data evaluation. More research is needed to establish criteria for success in implementing CRM in healthcare organisations. Attention should be paid to both the intervention itself as well as the conditions of the surrounding organisational structure. We acknowledge the vast and pioneering work of all authors who conducted and published the studies this review is built on. Wherever weaknesses of the existing CRM research are indicated in this article, our intention is not to criticise the past but to give an impulse for the future and contribute to pushing patient safety forward. We are especially grateful to Carolin Braun, MA for her comments on earlier versions of the manuscript and helpful feedback during the whole process of writing the paper.
. To Err Is human building a safer health system. Washington: National Academies Press, 2000. World Health Organization. Patient safety curriculum guide: multi-professional edition. Geneva: World Health Organization, 2011. Health and Safety Executive, editor. Reducing error and influencing behaviour. 2 edn. Sudbury: HSE Books, 2007.
. Anesthesia crisis resource management training: teaching anesthesiologists to handle critical incidents. Aviat Space Environ Med 1992;63:763–70. European Aviation Safety Agency. Commission Regulation (EU) No 965/2012 on air operations in combination with AMC1 ORO. FC 2018;115.
. TeamSTEPPSTM: team strategies and tools to enhance performance and patient safety. 2008.
. Evaluating training programs: the four levels: Berrett-Koehler Publishers, 2006. United Nations Development Programme. Work for human development. New York, NY: United Nations Development Programme, 2015.
. Culture at work in aviation and medicine: Hamps Ashgate Publ, 1998. University of Aberdeen. The Non-Technical Skills for Surgeons (NOTSS) system handbook v1.2, 2012. www.abdn.ac.uk/iprc/notss.
. Reframing implementation as an organisational behaviour problem: inside a teamwork improvement intervention. J Health Organ Manag 2015;29:670–83.
. Impact of simulator training and crew resource management training on final-year medical students’ performance in sepsis resuscitation: a randomized trial. Minerva Anestesiol 2012;78:901–9. Contributors BG and LR did the acquisition, analysis and interpretation of the data. BG drafted the manuscript in close collaboration with AZ. JK and JMZ reviewed and advised study conception and interpretation on a regular basis. MRF and SP oversaw the whole process from a senior perspective and provided advice during each step. All authors contributed substantially during revision of the manuscript and gave final approval for publication. Data sharing statement The raw data for this review have been compiled using MAXQDA software. All the tags and codes are available (about 3300 passages coded). Because this dataset also contains all the original articles in form of PDF documents, we cannot publish them without violating intellectual property rights. Nonetheless, we are open for requests from fellow researchers and will try to comply within the legal possibilities.